YOU are the Mirrors of the Future . "You are the Mirrors of the Future"
for all my glowing experiences of JOY: pain, sadness or happiness. I am happy to know you, but who you truly are is not fully known! What lies enfolded in your destiny is yet to unfold. You are the Mirrors of the Future, just like me and others before me. from beginner’s innocence to wholeness or perfection - Innocence. I am happy to love you and want you to know that life is simple yet paradoxical. POSITIVITY - PRESENCE - POSSIBILITY- PROMISE - PEACE - PURPOSE – PRAYER. 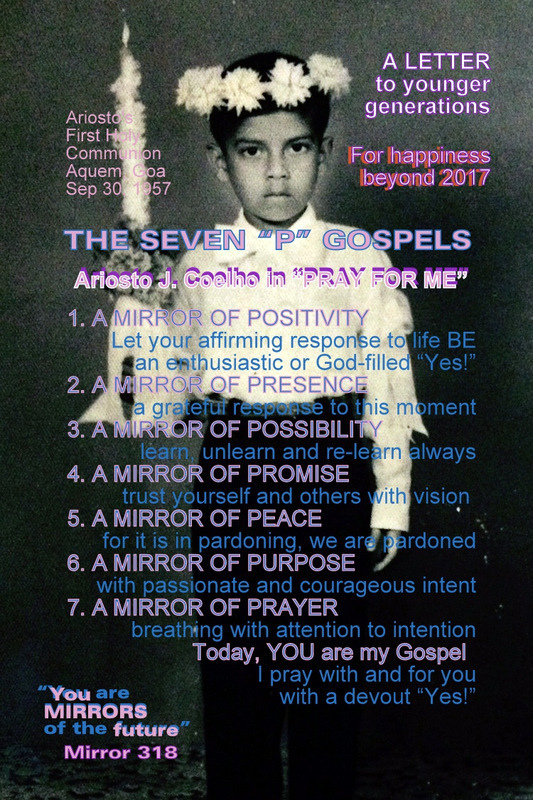 Believe in The Gospel of Promise where truth leads you to trust yourself and others with a courageous and visionary “Yes!” to the goodness, beauty, and order which await you in our shrinking global village. With Prophet Jeremiah [29:11] I am optimistic. As I read The Future (2013) by Al Gore I am reminded of Alvin Tofflers’ Future Shock (1970) and John Nashbitt’s Megatrends (1982). Today, Steve Case’s The Third Wave: An Entrepreneur’s Vision of the Future (2016), Alec Ross’ The Industries of the Future (2016), Sean Carrol's The Big Picture: On the Origins of Life, Meaning and the Universe Itself (2016) and Parag Khanna’s Connectography: Mapping the Future of the Human Civilization (2016) make me wonder what amazingly amusing adventures lie in store for you. May these adventures lead to peace on Earth. May you glow with “Yes!” as The Gospel of Peace described by the mystic Francis of Assisi in his Peace Prayer, which I have slightly modified here to include laughter. “O, Divine Master, grant that I may not so much seek, to be consoled as to console; to be understood as to understand; to be loved as to love; For it is in giving that we receive; it is in pardoning that we are pardoned; it is in dying that we are born again to eternal life;” it is laughing that we glow as Integral Being. May you experience the power described by Rick Warren, one of the most popular contemporary spiritual writers, in The Purpose Driven Life . Live The Gospel of Purpose with a passionate “Yes!” Warren writes "Contrary to popular book titles, there are no Easy Steps to Maturity or Secrets of Instant Sainthood. When God wants to make a mushroom, he does it overnight, but when he wants to make a giant oak tree, he takes a hundred years. Great souls are grown through struggles and storms and seasons of suffering. Be patient with the process. ... A delay is not a denial from God. Remember how far you've come, not just how far you've got to go. You are not where you want to be, but neither are you where you used to be" [pp122-123]. Finally, be “Yes!” The Gospel of Prayer described throughout this book. I am grateful to you for reading this far. May I request you to join me in uniting with all who prayed and celebrated Catholic Sacraments, Ecumenical and Interfaith Rituals with me in many delightful Communities of Faith, Hope and Love. and ordained a PRIEST on December 21, 1977. Today, YOU are my Gospel. May you find God or the best in everything that happens to you.